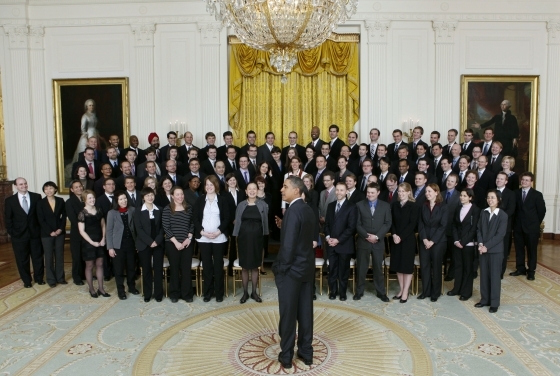 Dr. Cox (second row, 8th person from the left) meeting President Barack Obama after receiving a PECASE January 2010 at the White House. Photo courtesy of the American Society of Mechanical Engineers. President Obama honored 100 winners, including Dr. Monica Cox, with the Presidential Early Career Award for Scientists and Engineers (PECASE). This is the highest award bestowed by the U.S. Government upon scientists and engineers in the early stages of their independent research careers. Read the full article. Click here to view academic publications by the i2e2a team. Click here to view media appearances by the i2e2a team.